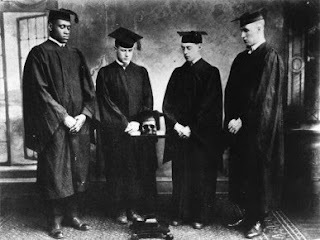 It is no exaggeration to say that Paul Robeson was one of the most remarkable humans to ever live. He was intellectual, athletic, and handsome, with a rich bass-baritone voice and a joyful, intoxicating charisma. Robeson seemed able to conquer any arena. As an honor student on scholarship to Rutgers, he was a legendary four-letter football player, making the All-American team in 1918. After graduation, he studied law at Columbia University. Not long after his schooling, he became a successful stage actor and recital singer. He is even reported to have learned twenty languages, which enabled him to perform folk songs in their original languages. 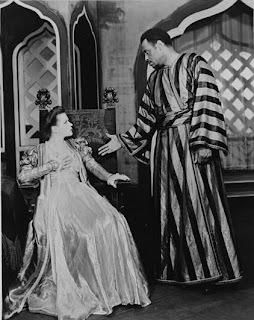 Robeson was the first African American man to lead a white cast in a major production of Othello, which was so successful that it became the longest-running Shakespearean play in Broadway history. His stage work led to a both fruitful and frustrating career as a movie actor, which today gives us the some of the most vivid material from which to try to gain an understanding of his legend. The quick-witted, proud Robeson was also politically outspoken, which caused him a great deal of trouble (though he undoubtedly gave courage to future generations). He protested segregation and discrimination, and was a vocal supporter of labor activism, the Communist party and the Soviet Union, among other controversial issues. These radical beliefs, coupled with a refusal to testify before the House Un-American Activities Committee in the fifties, took a serious toll on Robeson’s career, safety and eventually, his health. The FBI kept a massive file on Robeson and his wife Eslanda, and the United States government ultimately revoked his passport, claiming that his views could harm the nation’s image abroad. Robeson fought for a decade to regain the right the travel so that he could earn his living abroad. These controversies dealt a severe blow to Robeson’s American career as a recital singer. He also endured criticism from the African American community, where many people feared that his actions would hinder the advancement of the race. Several of those who did associate with him, including Lena Horne and Dorothy Dandridge, were also subject to government pressure. Robeson fought mightily against his oppressors, but though he defended himself with bravery and eloquence, the strain of the fight became too much for even this great man to endure. In frail health, he eventually withdrew from the public eye, and lived the last years of his life with his sister in Philadelphia, where he died in 1976. Robeson’s movie career was short-lived (he was active between 1925 and 1942), but it was significant piece of his turbulent life. He alternated between the Hollywood and English film industries, taking roles that he thought dignified and heroic. Despite Robeson’s strenuous efforts to elevate his race through his movie work, he was often betrayed by his employers in the editing room. For this reason, he would occasionally agree with the African Americans who protested some of his films. The primary problem was that while Robeson did not technically play servants in his movies, he tended to end up in service to the white man anyway. Robeson is such an astonishing spectacle on the screen that even the least satisfying of his movies are worth a look, but he was always at his best when he played a role in which he drove his own fate. This silent produced by Oscar Micheaux was Robeson’s first movie. If it were not for Robeson’s boisterous contribution, it is unlikely that this awkwardly plotted and erratically edited production would be remembered today. He plays dual roles--the more subtle being the poor, but honest suitor of the leading lady and a more showy part as a gleefully evil ex-con posing as a preacher. Robeson spends most of his screen time in the preacher role, and it is here that he is at his most potent. With his wide grin and confident swagger, you almost forget that you can’t hear him speaking. This story was familiar territory for Robeson, as he had starred in the original stage production of the Eugene O’Neill play. He plays a Pullman porter, who accidentally kills a man, ends up on the chain gang, and in the course of his escape from captivity ends up on a tropical island. There he manipulates the residents to better his circumstances, until he finally finds himself the ruler of the island. However, he is a corrupt and arrogant king, which leads to his downfall. In one of his best performances, Robeson reveals a man who is clever, but doomed by a lack of humility and restraint. There is no less confidence in his manner when he is a porter shouting “yessir” than when he is barking orders from his throne. His boundless energy helps him to win his conquests, but he can’t balance his bravado with the level-head necessary to stay in power. Robeson ably shows the weakness within this seemingly indomnitable man. This was Robeson’s first Hollywood movie, and another role he played originally on the stage. In it, he performed the definitive version of ‘Ol Man River, a song that would become his personal anthem (he would even change the lyrics in later performances to fit his current personal an political views). He so moved the musicians in the recording studio that the orchestra applauded him. Robeson was also a sensation on the set, where technicians and grips eagerly gathered to watch him sing. Eslanda Robeson wrote of the crew, “If you can interest them, you’re good.” Director James Whale was also impressed with Robeson, and wanted to direct him in a starring vehicle, but the project never materialized. 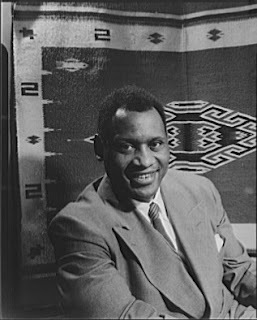 Though he was a triumph in the role, Robeson was uncomfortable with his stereotypically lazy character. He did not offer much resistance when the role got some criticism from the black press. Robeson found his favorite roles overseas, in the more politically-progressive British industry (though he did still suffer his share of indignities). This was one of the rare instances where his character had the dignity he desired. He plays a World War I soldier who accidentally kills a superior officer and then escapes prison (yes, there are many similarities in the plots of Robeson's movies). Picking up a white army deserter on the way, he steals a boat, and eventually finds himself in the desert, where he quickly becomes the leader of a Bedouin tribe. While he lives a prosperous life with a new wife and his white sidekick, the army captain he betrayed to gain his escape tries to find him and bring him to justice. It is gratifying to see Robeson in such a powerful role. He seems to relish playing an intelligent and heroic leader who, when he learns that the captain who once befriended him has suffered because of his escape, also has the integrity to want to make amends.